This Thursday. 6:30pm to 11pm. Andrés Duany and Sjoerd Soeters will give a special presentation at 8pm. Includes: Food trucks, kegs of local brew, bonfires, and more! Buffalo’s Silo City is a landscape unlike any other on the planet. Grain elevators— the largest collection of such structures anywhere—tower over the Buffalo River, once the world’s largest grain port. 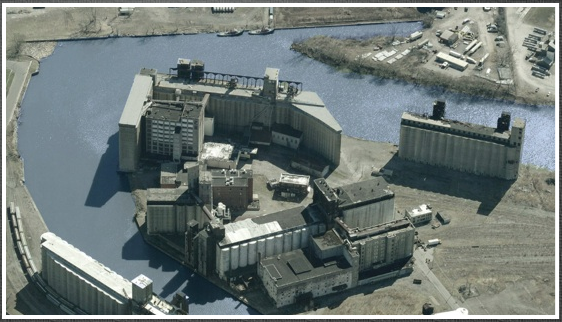 Buffalo’s role as grain capital virtually ended when the St. Lawrence Seaway opened in 1959, but these industrial giants remain, awaiting adaptive reuse. Explore these ruins with local activists. Food trucks, kegs of local beer, and a bonfire will be highlights. Need a ride? At 5:30 pm at the Convention Center, hop on the Open Air Autobus for a $35, 90-minute waterfront tour that will conclude at Silo City (and bring you back!). The event is sponsored by the Campaign for Greater Buffalo.